In some ways, Deus Ex: Human Revolution feels like a window into an alternate history, a world where intensely detailed and complex video games stayed popular and kept big budgets, rather than streamlining their experiences to make them slicker and more accessible to a broad audience. The game has a number of concessions to modern design practices, and lacks the polish of other modern shooters. But that throwback feel keeps it constantly compelling. It's a game with a fresh face but an older heart, one that makes for a unique experience all the way through. Human Revolution is a prequel to Deus Ex, starting to bridge the gap between our world and one forty years in the future, where nationalities have started to fade away as corporations seize more and more influence. The nanotechnology of the original game hasn't been created yet, but lots of people still have augmentations, in the form of more visible implants, including limbs that have been entirely replaced by machinery. Technology is advancing, though it's limited by the human body's natural resistance to it, which must be treated by proprietary medicine. 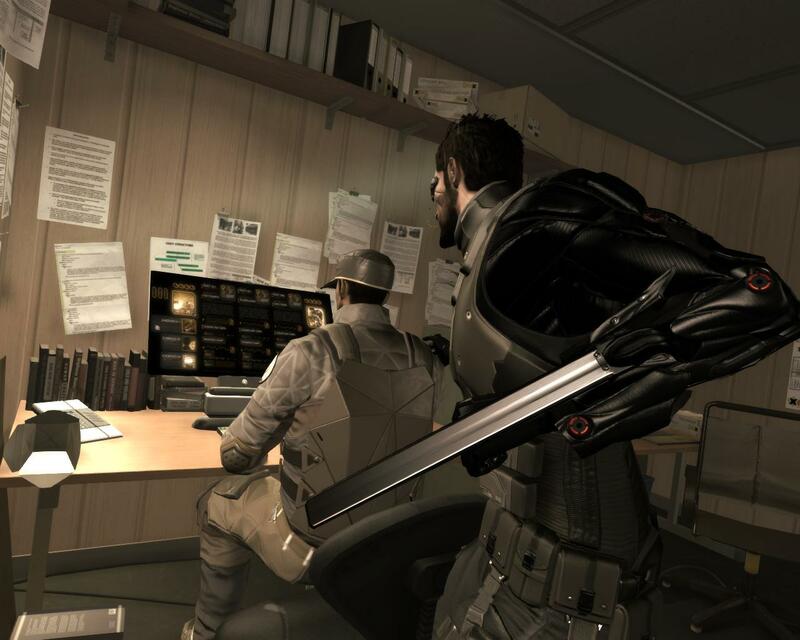 You play as Adam Jensen, chief of security at one of the companies working on augmentation research, when it is attacked. Several scientists are killed and you only survive thanks to an expensive process that rebuilds your whole body, Robocop-style. You awake six months later with your company facing another crisis, and that's when the game really begins. The main gameplay in Human Revolution feels like a pretty normal shooter, with full freedom of movement and a cover system that pops you into a third person view. The cover is useful for both combat and stealth, letting you slide around corners and leave from position to position without much trouble, and the weapons handle well. The shooting doesn't pack the punch that some more focused shooters do, but it's more than adequate for this kind of game, and much better than others with split focuses. You will encounter enemy patrols, a variety of security systems, and even robots of varying levels of intimidation. There are a lot of air vents and alternate routes to either get around or get the drop on your enemies, and there's a certain satisfaction to either gunning them down or slipping by without them noticing. Plenty of games have latched onto player agency as a major part of their design in recent years, but they usually tend to hinge it on some sort of moral compass, whereas in Human Revolution, it's more a question of practicality. Depending on your skills, you might prefer to stealthily sneak your way through an area, or to wipe out all opposition as you're passing through. Either is valid, and the game doesn't judge what choices you make. Using your melee ability to kill an enemy rather than just knock him out is louder, and lethal weapons make a lot of noise until you find a way to suppress it, so violent players will generally be less stealthy. Non-lethal weapons are less effective in dangerous combat situations, so peaceful players will generally be less confrontational. You can mix and match though, and a big part of the game is just doing what feels right in a situation. I tended to use non-lethal takedowns and sneak through missions when I could, resorting to the big guns when I got spotted, rather than reloading a save. It was an approach I enjoyed a lot, and is no more or less valid than any other. A huge part of how you play the game is decided by how you upgrade your augmentations. Completing objectives, exploring hidden areas, and defeating enemies earns you experience points. Getting through an area without getting spotted earns you a big bonus, so there's a balance between being loud or quiet. Leveling up earns you Praxis points, which you can also get by buying or finding Praxis kits. Praxis points unlock new abilities and improves the ones you have, which make your play experience really flexible. Certain paths will make you better at hacking, which allows you to open new doors, learn useful information, or even turn the enemy's security systems against him, which is always fun. Other paths beef up your ability to resist damage, fire weapons, or navigate a room unseen, supporting any play style. Several upgrades give you access to alternate paths, such as the one that lets you punch through a wall, or the one that lets you breathe contaminated air. I didn't unlock some of the flashier abilities like briefly turning invisible until later, concentrating on allowing myself as many routes through an area as possible, and getting better at hacking. But as long as you don't concentrate too heavily on a single thing, you should be fine for any task the game gives you. The story jumps you back and forth between letting you explore a couple of different open-ended hub levels, and more directed sequences in enclosed enemy strongholds. They're both fun, though I think the game really shines more in the hubs, which maximize the concept of being able to do whatever you want. Unfortunately after a point you're pretty much stuck on a one way path to the end, but it's not until you've had plenty of time to explore the game world. The hubs have a bunch of NPCs to interact with, hidden items to find, and sidequests to discover and finish, which tended to be at least as interesting if not more so than the required content. You might find yourself sneaking into a police station to dig up some dirt on a cop who won't help you, or taking out the brothel owner who's forcing life-changing augmentations on his women. I actually ran into a bug that halted my progress in one of these quests for a little while, which was very unfortunate, but it's the kind of thing that pops up in these more open games once in a while, and I never had a problem with anything you need to actually finish the game. A big part of exploring the world, at least if you're interested in it, is hacking, and for once a developer made a minigame for it that actually sort of resembled what a hacker might do and was kind of fun to perform. You have to find a path through a series of directories and junk folders to get to the information or access you need before you activate the system's defenses and it stops you, and you can get upgrades or expendable programs for assistance. Another minigame Human Revolution likes to throw out is the conversation system, where occasionally you will have to use a variety of psychological approaches to convince someone to do or not do something. I found the conversational paths logical enough that I never messed these up, though if you need help there are augmentations for that as well. Without a doubt, the biggest sticking point in the game is the boss fights. There are a handful of them, pitting you against other heavily augmented combatants, and they are the one place in the game that doesn't support multiple approaches very well. It's difficult enough to get past them without using heavy firepower that the game actually ignores them when it comes time to determine whether you earn the achievement for finishing the game without killing anyone. If you're equipped to handle them, either through brute force and the right augmentations or an above-average mind for exploiting weaknesses, they aren't that difficult, but they still aren't particularly interesting or inspired. It's best just to accept them as a necessary evil of game design and move on quickly. I honestly would have been disappointed if they had never taken on the inherent possibilities of two super soldiers fighting each other, I just wish they were executed better. I also have an issue with the game's presentation. I think the music is nice, the graphics are technically decent, and the distinctive art design is effective. But interacting with other characters is often a chore. The voice acting is almost universally terrible, and the dialogue animations for everyone except Adam (who just stands there stoically) are embarrassing. They look like animations from last generation, or from any era when animators forgot to look at what people actually do when they're talking. I liked the verisimilitude of just dropping in on everyday chitchat between people, but for a game with so much focus on interacting with humans, they really failed to present it well. The main plot of the story itself is fine. It's kind of a standard near-future science fiction morality tale and a bit silly in places, but there are enough interesting ideas tackled that it's not a complete waste of time. These are small niggles though, the sort of flaws that seem like inherent casualties of creating a game with this scope. I've played more sophisticated games, and better looking ones, but rarely ones that combine the two elements this well. It's a meaty adventure that easily provides twenty hours of gameplay, and never wears out its welcome over that time. I was hoping for a bit more in places, but it's a worthy follow-up that the original game should have gotten long ago. And considering how poorly that game's engine has aged, Human Revolution is probably the best introduction you can get to the series.